As it now stands, the “Christmas season” begins sometime in November. The streets are hung with lights, the stores are decorated with red and green, and you can't turn on the radio without hearing songs about the spirit of the season and the glories of Santa Claus. The excitement builds to a climax on the morning of December 25, and then it stops abruptly. Christmas is over, the New Year begins, and people go back to their normal lives. The traditional Christian celebration of Christmas is a bit different and exhortations to follow this calendar rather than the secular one have become routine at this time of year. The season of Advent begins on the fourth Sunday before Christmas, and for nearly a month Christians await the coming of Christ in a spirit of expectation--singing hymns of a longing that in many ways culminates on December 25. But if we look a bit deeper into Christian history, we discover that Christmas Day itself ushers in twelve more days of celebration, ending on January 6 with the feast of the Epiphany. More than just lending their name to a cryptic holiday song, the “real” twelve days of Christmas give us a way of reflecting on what the Incarnation means in our lives. 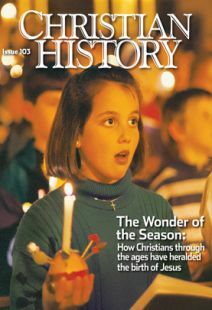 Christmas commemorates the most momentous event in human history—the entry of God into the world in the form of a baby. The Logos through whom the worlds were made took up his dwelling among us in a tabernacle of flesh. One of the Christmas Day prayers in the Catholic liturgy encapsulates what Christmas means for all believers: “O God, who marvelously created and yet more marvelously restored the dignity of human nature, grant that we may share the divinity of him who humbled himself to share our humanity.” In Christ, our human nature was united to God, and when Christ enters our hearts, he brings us into that union. The three traditional feasts (dating back to the late 5th century) that follow Christmas Day reflect different ways in which the mystery of the Incarnation works itself out in the body of Christ. December 26 is the feast of St. Stephen—a traditional day for giving leftovers to the poor (as described in the carol “Good King Wenceslas”). As one of the first deacons, Stephen was the forerunner of all those who show the love of Christ through their generosity to the needy. But more than this, he was the first martyr of the New Covenant, witnessing to Christ by the ultimate gift of his own life. St. John the Evangelist, commemorated on December 27, is traditionally thought to be the only one of the twelve disciples who did not die a martyr. Rather, John witnessed to the Incarnation through his words, turning Greek philosophy on its head with his affirmation, “The Word was made flesh, and dwelt among us” (John 1:14, KJV). On December 28, we celebrate the feast of the Holy Innocents, the children murdered by Herod after the birth of Jesus (Matt. 2:16). These were not martyrs like Stephen, who died heroically in a vision of the glorified Christ. They were not inspired like John to speak the Word of life and understand the mysteries of God. They died unjustly before they had a chance to know or to will—but they died for Christ nonetheless. In them we see the long agony of those who suffer and die through human injustice, never knowing that they have been redeemed. If Christ did not come for them too, then surely Christ came in vain. In celebrating the Holy Innocents, we remember the victims of abortion, of war, of abuse. We renew our faith that the coming of Christ brings hope to the most hopeless. And, in the most radical way possible, we confess that like the murdered children we are saved by the sheer mercy of Christ, not by our own doing or knowing. In the Middle Ages, these three feasts were each dedicated to a different part of the clergy. Stephen, fittingly, was the patron of deacons. The feast of John the Evangelist was dedicated to the priests, and the feast of the Holy Innocents was dedicated to young men training for the clergy and serving the altar. The subdeacons (one of the “minor orders” that developed in the early church) objected that they had no feast of their own. So it became their custom to celebrate the “Feast of Fools” around January 1, often in conjunction with the feast of Christ's circumcision on that day (which was also one of the earliest feasts of the Virgin Mary, and is today celebrated as such by Roman Catholics). It is easy to dismiss all these customs as pagan holdovers (which many of them are), or at best as irrelevant and harmless follies. Indeed, the medieval church frowned on most of these practices, and the Reformers of the 16th century finished the job of suppressing them. But perhaps there's a message here worth pondering—that in the words of the horrified pagans of Thessalonica, the message of Christ turns the whole world upside down. In the birth of Jesus, God has put down the mighty from their seats and exalted the lowly. He has filled the hungry with good things and sent the rich away empty. Nothing will ever be safe or normal again. In the words of Michael Card, we are called to “follow God's own fool.” And yet, paradoxically, this greatest of revolutionaries was not a rebel. The one who revealed the surprising meaning of God's Law and turned the tables on human traditions nonetheless submitted to be circumcised according to the teaching of Moses. Finally, on Epiphany (January 6), the celebration of Christmas comes to an end. “Twelfth Night” (as all lovers of Shakespeare know) is the ultimate celebration of Christmas madness (Shakespeare's play features one of his many “wise fools” who understand the real meaning of life better than those who think they are sane). Epiphany commemorates the beginning of the proclamation of the gospel—Christ's manifestation to the nations, as shown in three different events: the visit of the Magi, the baptism of Jesus, and the turning of water into wine. In the Western tradition, the Magi predominate, but in the Eastern churches, Jesus' baptism tends to be the primary theme. In Bucharest, children leading lambs walk through the subway trains in commemoration of the Lamb of God to whom John pointed. Orthodox Christians traditionally have their homes blessed with holy water on or around this day. Nowhere is Epiphany celebrated more joyously than in Ethiopia. Pilgrims from all over the country converge on the ancient city of Aksum, where they bathe in a great reservoir whose waters have been blessed by a priest. Epiphany is often a forgotten festival. As the true end-point of the Christmas season, however, Epiphany sends us into the world to live out the Incarnation, to witness to the light of Christ in the darkness. Following Jesus, we have been baptized into his death and resurrection. Whether we are called to martyrdom, or to prophetic witness, or simply to faithful living in the joys and sorrows of our daily lives, we live all of our days in the knowledge of our dignity, redeemed through Christ and united to God. We are part of the strange society of people whose world has been turned upside down, and we go out to witness to this topsy-turvy truth: “The Word was made flesh, and dwelt among us: and we beheld his glory … and of his fullness have we all received, and grace for grace” (John 1:14, 16). Jennifer: Freelance writer living in Huntington, IN; adjunct or affiliate professor of history/church history at Asbury Seminary, United Seminary, and Huntington University; and author of The Poisoned Chalice. Edwin: Adjunct professor of history/church history at Asbury Seminary, Huntington University, and the University of St. Francis.